The road well-traveled took Acadiana Prep football legend Kerry Joseph to four countries, two continents, three leagues (one since defunct), eight teams (one since folded), and even a boomerang-ish switch from offense to defense then back to offense, which ultimately brought him to a destination he would have reached had he just stood still 22 years ago: home. According to the numbers, she’s right. In 2016, Joseph’s first season as wide receivers coach/co-offensive coordinator at McNeese, the Cowyboys’ offense averaged 32.0 points and amassed 441.3 yards per game, 304.2 of which came via the passing attack, which was good for second-best in the Southland Conference. Speaking on the eve of the upcoming season with the enthusiasm of a guy who knows his quarterback returns and will be dispensing the ball to a wide receiver corps seven or eight players deep, Joseph can’t help but steer the conversation towards this bright future even when answering questions about his playing past. If Joseph’s name sounds somewhat familiar for a guy whose legacy was largely cemented in the anonymity of Canadian professional football, there’s a reason. In the late 1980s-early 1990s, Joseph was a Friday-night phenom behind center at New Iberia High School. Not surprisingly, scholarship offers from the SEC, SWC and Big 8 came pouring in, but none afforded Joseph the opportunity to play quarterback because of his height (or lack of it), so he signed at McNeese State and spent the next four years littering the record books with his name. To this day, Joseph remains the school’s career leader in passing touchdowns. Despite immense collegiate success, Joseph remained a few inches shorter than the NFL ideal when it came to quarterbacks, so he transitioned into a bit of a human Swiss Army Knife with cleats. With the Washington Redskins, he moonlighted as a running back but that didn’t stick. The next year, the Seattle Seahawks signed Joseph and converted him to defensive safety, where he played four seasons and recorded three career interceptions. In 2003, Canada came calling. The Ottawa Renegades offered Joseph the opportunity to play quarterback, sparking a decade-long career up north that resulted in a championship, an MVP season and a reason for New Iberia to throw a parade and give Joseph the key to the city in 2008. All that fanfare amounted to squat when Joseph searched for a transition from the field as a player to the sidelines as a coach. A process he simply calls “a grind” began officially in 2014 when Joseph completed a three-week coaching internship with the New Orleans Saints. From there, Joseph attended the Senior Bowl in Mobile, Alabama (a scouting combine, but also a huge networking event) and the American Football Coaches Association convention, all while working with Nike’s Elite 11 high school quarterback academy and offering personal training on the side. “When you’re looking for a job, and you’re at coaching conventions, it’s hard to get people to talk to you,” Joseph says. “Now that I have a job, when you go, everyone wants to talk to you. That’s just how it works. That’s why I’m so thankful for the opportunity. And now that I have it, you try and make the most of it. 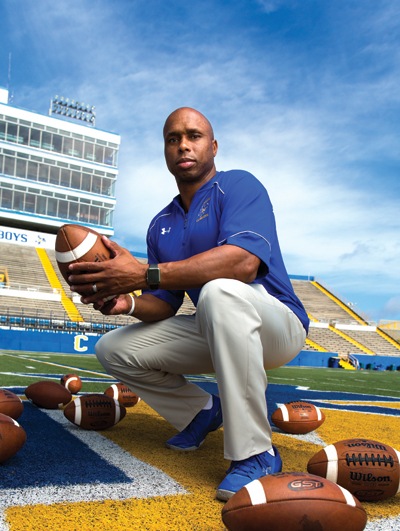 Because of Joseph’s equity in the region, he’s assigned to recruit the well-stocked high schools in and around Lafayette — programs now run by some former teammates and former opponents — which creates plenty of trips down memory lane as Joseph attempts to restock McNeese’s roster with talent from a vital area. Currently, 28 players on McNeese State’s football roster hail from the 22-parish Acadiana region. “It all comes down to a matter of trust,” Joseph says of both finding new players and teaching current players. “Do these guys trust you? And can I trust them, and can the man next to them on the field trust them to do what’s expected. And I think it helps break the ice that when these kids look at me, they know I’ve been somewhere where they want to go…I don’t make it all about me, because there are guys here that could [not] care less about what I’ve done — and really, I like that. ‘It’s not about your past career. What can you do for me?’ But they all wanna get there — playing in the NFL, earning a living playing this game.